From all of us at Legacy Family Tree, we'd like to wish everyone a happy new year. We'll take a few hours off tonight to celebrate, and then get back to finishing version 7.5 (new FamilySearch interface tools). We're actually very close to being able to release our FamilySearch interface to all of you, and are finishing up some last minute programming issues. If only 2009 were two or three weeks longer, we might be on time with this. Thanks for hanging in there with us. We hope you enjoy the new start that a new year brings - and may everyone have many Genealogy Happy Dances in 2010! This past year has been very successful for our company, all thanks to our great Legacy Family Tree users - you! Our company (Millennia Corporation) celebrated our 25th year in business, and the 12th year since we first released Legacy. We also traveled a lot this year (over 50,000 miles in fact) attending conferences, user groups, and seminars in Texas, Arizona, Utah, California, Alberta, Saskatchewan, North Carolina, Colorado, Wyoming, Arkansas, Washington, British Columbia, Greece, Spain, Italy, Croatia, and Turkey. The year started off with the birth of the world's cutest new Legacy user. My daughter, Kaitlyn, was born in January. They sure grow up a lot in the first year. Her three older brothers are taking good care of her. Also in January, Legacy Family Tree 7.0 was awarded with the ThinkGenealogy Innovator award for our implementation of the SourceWriter. Legacy was the first genealogy software program to incorporate Elizabeth Mills' guidelines from Evidence Explained, and with its 1,300+ templates, continues to be the most comprehensive tool for correctly citing sources. In February we gave away our first netbook computer at the St. George Family History Expo, and have had fun at conferences all year long giving away great prizes, including copies of our Legacy software. In April, FamilySearch announced that their 250 millionth name had been indexed by their volunteer indexing program. Later in the year they announced that they had surpassed 130 million names in 2009. Congratulations and thanks to all the volunteers. Those numbers make my 46,159 indexed names seem trivial, but every indexed name means a once-lost-ancestor might be more easily found for someone. April was also an exciting month for researchers tracing their European ancestors when we announced the availability of the Centennia mapping software. Centennia shows the changing country boundaries in Europe and the Middle East from the beginning of the 11th century to the present. Centennia is available on CD or to download. This summer, after releasing the new book, Social Networking for Genealogists, we expanded our communication networks by joining Twitter and creating a Legacy Family Tree Fans group at the new social networking site, GenealogyWise.com. Our fans group is one of the largest and active groups in their network. Also this summer we tried something new which turned out better than we had ever hoped. Although we traveled over 50,000 miles this year to teach Legacy at seminars, we still cannot visit every place that we would like. Until now. The Hemet-San Jacinto Genealogical Society in California was kind enough to let us record our Legacy presentations at their seminar and make them available online for Legacy users around the world to view. Only a small number of students attended the classes live, but thanks to new technology, thousands and thousands of you have attended "virtually". You can watch the seminars online by clicking here. In August we celebrated the fourth birthday of our Legacy News blog. This article is now our 779th post to this blog. I thought by now I wouldn't have anything left to say....Our readership statistics continue to increase so I guess we're doing something right. We will continue to use this blog to bring you the latest tips and updates on using Legacy as well as news and information from the entire genealogy industry. In September we quietly celebrated (I forgot to write about it until now...) one of our company's biggest achievements. Our software, Legacy Family Tree, entered retail stores. Stores such as Office Max, Fry's Electronics, Micro Center, and Office Depot now sell our software. It's not easy getting software into stores like this, but now Legacy's influence goes well beyond genealogy seminars and online shopping. It goes without saying, but the highlight of 2009 was our 6th annual Legacy Genealogy Cruise. In addition to the Legacy and technology classes, we visited the sites in Spain, Italy, Croatia, Greece, and Turkey. Next year, thanks to your votes, our 7th annual Legacy Genealogy Cruise will depart Sydney, Australia and explore beautiful New Zealand. We're excited to meet many of our Legacy users from "down under" and hope that you will join us. Our last "good move" of the year was the decision to re-sell the Crash Course in Family History book. When I first browsed through Paul Larsen's book, I knew this was something our Legacy users needed to have. It has been a very successful book in our online store, and I'm glad that so many of you have enjoyed it now. As 2009 comes to a close, we are happy with the progress we are making as a company. We've had successes and learning moments, and have developed a great plan for 2010 and beyond. One more thanks to the entire genealogy community for all you do to help genealogy progress. Happy New Year to everyone! Today started out with another Genealogy Happy Dance. I found the maiden name of a female ancestor who was born in England, and who probably died in Minnesota. I wondered if I knew when she immigrated and so I checked out her Chronology View (see image below) to see if I had found this yet. Nope. Then I remembered that the 1900 U.S. census lists the immigration year. The 1900 census was listed in her Chronology View, with 1858 as her year of immigration. She would have been about eight years old. But her 1858 immigration was not listed as an event in her timeline. Knowing the rule of timelines, whenever I have a date/place for an event in a person's life, I need to add a custom event for that person. This event will then show up in their timeline. So, creating a custom event is pretty easy. From the Individual's Information screen, click on the Add button and fill in the information (see image below). Once the event has been added, I need to add its source (where I found the information about the immigration event). The source is the 1900 census. I could 1) re-enter the master source and its detail, or 2) since I've already typed this source when documenting her birth date which I found from the 1900 census, I could use the "copy source to clipboard" button and paste the source to the new immigration event. On the Assigned Sources screen, click on the citation that you want to use, then click on the small "copy source to clipboard" button found in the lower left (see image below). Now that the complete citation (master source and the detail) is on the Source Clipboard, I can now click on the Immigration event on this same screen, and click on the "Add clipboard source to the current event" button (see image below). The immigration event now has the 1900 census citation attached to it, and I did not have to retype the citation. Working from the Chronology View, it's easy to visualize when she immigrated and where she lived throughout her life. As researchers, we must know when and where a person lived so we know where to look for potential records. This is what makes the Chronology View so important. We spend a lot of time looking for our ancestors. Wouldn't it be nice if they just showed up in our email's inbox? With the free tool, Google Alerts, this is possible. I don't know how many thousands or millions of new web sites are created each month, but if we really want to find on the Internet what we are looking for, then we have to continually search and re-search - and then do this every month to see if any of the new web sites contain what we are looking for. By creating a Google Alert, whenever Google finds your word or phrase that you are interested in, Google will automatically send you an email. For example, I am searching for an ancestor, James Marion McCall. If, today, I don't find anything relevant, I can create a Google Alert for his name, and then work on other things, such as get ready for our 7th annual Legacy Genealogy Cruise to Australia and New Zealand. :) Then, if someone publishes new information to a website that Google finds, I'll get an email with a direct link to the new page. 1) Go to www.google.com/alerts, enter your search terms, your email address, and click "Create Alert". 3) Sit back and relax. Do something with your living relatives. Go on vacation. Read a book. Spend some money in the Legacy online store. Free Shipping from Legacy Family Tree - 3 days only! We are offering THREE DAYS OF FREE SHIPPING on all Legacy Family Tree software and training CDs. Combine that with our Holiday Offer of $10 off Legacy software, and you've got a great last minute bargain. At checkout, enter the coupon code SantaLegacy and click Apply. Free shipping only applies to Priority Mailings to U.S. and First class mailings to Canada destinations ONLY and must include Legacy software or training CDs. Select your Legacy software and/or training CDs and click Add to Cart. At checkout, enter SantaLegacy in the coupon code box and click Apply. Offer is only valid December 15th, 16th, and 17th. It has probably happened to all of us. This morning it happened to me. I goofed. I was adding a new family into Legacy and then noticed that I added a child to the wrong parents. Instead of adding Esther Whitney as a child to her parents, I added her as a child to her brother. Do you notice anything strange about the birth years of Esther and her brother Elisha in the image below? Esther was born in 1799, and her father/brother was born in 1797. Legacy's Potential Problems report would have spotted this error later on, but I'm glad I caught it now. Fortunately, problems like this are easy to resolve. It's just a matter of "unlinking" the child from the wrong parents and then "linking" the child to the correct parents. No "deleting" involved. Here's how. 1) In Legacy's Family View, right-click on the child and select From Parents. Click Yes. 2) Now, navigate to the correct parents (might have to switch to the Index View to select them) in the Family View. Click on Add > Daughter/son. The Add screen appears. Here, instead of clicking on the usual "Add a NEW person" button, click on "Link to an EXISTING person". 3) Select the child from the list and click Select. Last week FamilySearch Indexing announced that so far, in 2009, volunteers have indexed over 130 million names. Completed projects and digital image collections are published online at http://search.labs.familysearch.org/. If you find something useful there, please consider signing up to help at www.familysearchindexing.org. You can even choose which records to index. Below is a list of new projects, recently completed projects, and the status of the current projects. Our Legacy User Group (LUG) mailing list is one of the resources we've made available for Legacy users to share ideas or ask questions. Have a problem or a suggestion and want the feedback of other Legacy users? You can subscribe to this mailing list and ask your question. Everyone else who is subscribed to the list will receive your question and have the opportunity to share their ideas. Once your question is answered, you may also unsubscribe. Best of all, subscribing to the mailing list is free. A few weeks ago, due to unforeseen technical problems, our mailing list stopped working. We just wanted to let you know that all is well again, and the mailing list is back online. 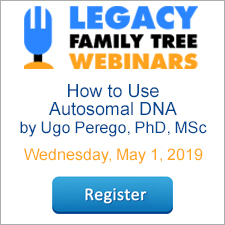 However, if you subscribed within the past few months, and you are not now receiving messages from the list, you will need to resubscribe at http://www.legacyfamilytree.com/LegacyLists.asp. If you need a mailing list for a different genealogy topic, place, or surname, the largest collection of genealogical mailing lists is at Rootsweb. As of today, they have 31,708 different mailing lists related to genealogy. Browse the lists at http://lists.rootsweb.ancestry.com/index/index.html. A step-by-step, colorfully-illustrated, easy-to-understand guidebook featuring 3-easy-steps to trace your family roots and stories. Walks you through the fascinating family history journey hand-in-hand! It couldn't be easier! Lots of new websites and technology tips. By gathering the available light, the magnifier makes the viewed item 4 times brighter than conventional magnifying glasses. Magnabrite is pre-focused, so it stays in focus at all times. To use, simply glide the Magnabrite over any surface - the focus is automatic and you can view subjects from almost any angle! The slightly concave buttom also reduces scratching to ensure years of use. An inexpensive gift for the whole family. Using Legacy Charting and a little creativity, your bookmarks will be the talk of the family this year. Click here for the step-by-step instructions. 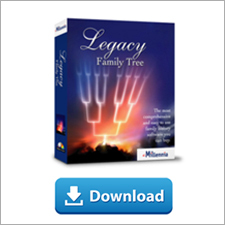 What better way to get others to help you with your genealogy than to give them the gift of Legacy Family Tree. We've made it easier and less expensive for you to purchase multiple copies of Legacy. Whether you purchase one item from us, or ten, the shipping/handling remains the same - one flat rate. Want to make sure your cards and packages arrive by December 25? Click here to see our holiday shipping deadlines.